Clash of Egyptian Archers - is an exciting game that will lead you into the World of Ancient Egyptian Civilization. What will be your feeling if you came back in your Empire after a long time and your enemies took kingdom from your ancestors and take your girl from you? So in this critical situation you have no any other chance except to fight with them and take your Empire and girl back from them. Train yourself as a Master of Archery! Run towards temple and survive the kingdom of Egyptian Empire. Be ready for Inevitable clash with skilled archers behind every hurdle. You are equipped with multiple weapons like sword and bow arrows. You can also buy suitable weapons like Arrows, Ax, Sword, Hammer and Mac etc from Virtual Purchasing shop by spend earned Points in game. They also put a Giant Spider inside the pyramid around your girl. Kill it before anything bad happens. 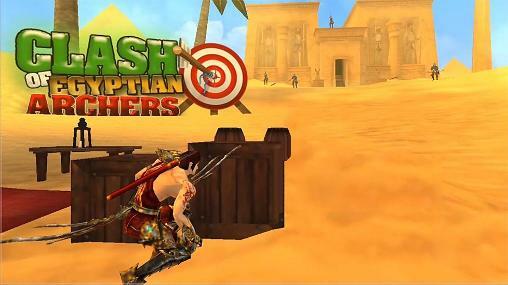 Clash of Egyptian Archers: Install APK and Play!